"It is my intention that every work I create will have the capacity to touch the soul." 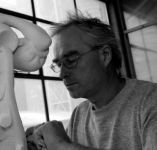 Paul Deans is a sculptor and portrait artist. He lives and works his art in Christchurch, New Zealand. His artworks feature in private and corporate collections in New Zealand and overseas. Commissions and exhibition works include watercolour and oil paintings, figures and portrait busts, family crests, and other sculptures in wood, limestone, polystyrene, clay and bronze. Paul has an intuitive connection with the materials of his artworks. He allows his ‘sense’ of the raw substance to guide his chainsaw and chisel, to bring life to the grain of the timber, the natural shape of the stone, and the texture of the clay. Solo exhibitions have included the New Zealand Embassy (Washington DC) The ArtHouse (Christchurch) and other New Zealand galleries. His sculpture has graced the front cover of the international ‘Woodcarving Magazine' with a feature article on his unique ability to sculpt portraits in wood. He is also a part time teacher of woodsculpture, portraiture and life drawing. He spent a very full-on two months with the sculpture department of "Lord of the Rings, Return of the King", creating figurative sculptures in polystyrene for the movie set. 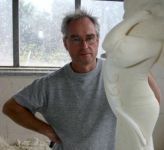 It is a testimony to his skill and expertise that he was subsequently asked to design and create a series of nineteen limestone sculptures for the folly on film director Peter Jackson's country estate. Paul grew up on the family property, Chawton, at Peel Forest, near Geraldine, South Canterbury. "Growing up with my father's art instilled in me a passion for creating beautiful things and so, by the age of four, I knew that's what I wanted. However, that heritage was also daunting and it took me a long time to admit that this is how I want to work and live." He initially studied Industrial Design at Wellington Polytechnic's School of Design in 1972-3, then worked at a variety of occupations and eventually, about 1990, returned to his original talent. He concentrated on developing his ability and passion for drawing and painting, as well as his unique gift for extracting the hidden forms and beauty in wood. "If that which is dead and lifeless but was once alive, can express such warmth and beauty, how much more could we who are living be able to express the spirit and grace that is within us?"